We all know walking your dog on a daily basis is crucial to your dog's training. It provides structure in their otherwise unstructured days, gives your dog a job, allows your dog to practice self control, and it gives you an opportunity to assert yourself as the leader in your relationship. However, walking your dog can quickly become chaotic and even dangerous if you don't properly train your furry friend. The other day, Tracy and I took the baby and our dogs out for walk around the neighborhood. Things were going great, until we approached a four way stop where a visibly reactive dog began to approach us from around the corner of a building. We initially thought he was a stray until we saw a flexi lead attached to him. 10 seconds later, from around the corner, came the owner holding the flexi lead and apologizing. Not only was it alarming to see the owner SO FAR behind their dog while on a walk, but he also allowed the dog to round a corner, out of his line of sight, and potentially cause another person or dog harm. Flexi leads, when used in place of a standard leash, ruin any chance of keeping your walk structured and are the source of so much frustration for your neighbors while you walk your little guy around the neighborhood. And if you're thinking "My dog is friendly, he wouldn't hurt anyone one on a flexi lead" - think about this: what if that dog who approached us was a friendly dog and we had an UNFRIENDLY one with us? That dog startled us and would definitely startle a dog who is easily spooked or reactive. Anyone who has struggled to train a leash reactive dog probably has stories about frustrating encounters with dogs on flexi leads or off-leash dogs that are poorly trained. You have to consider how your dog may make other dog's react, and do your best to keep your friendly dog safe! Flexi leads DO have a time and a place. They can be useful for recall training or used as a good "free-time" leash at the end or in the middle of a walk if your dog is not yet off-leash dependable. But as a standard leash, they generally only get you tangled up and put your dog in danger (stepping into the street at the wrong time) or other dogs in danger. 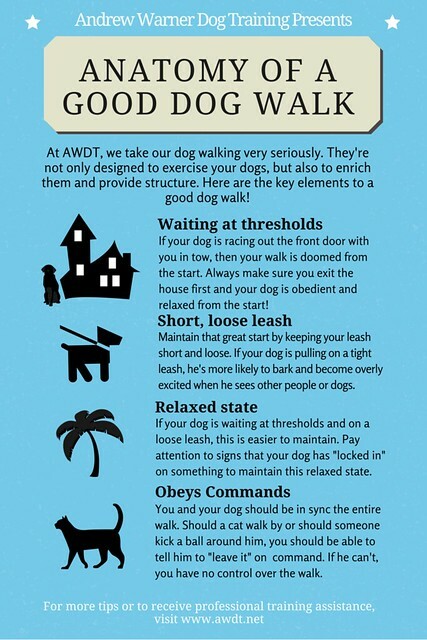 Everyone needs to practice responsible dog ownership, regardless of your dog's temperament, and ensure that you understand the anatomy of a good dog walk! Need help getting your dog in line? We got your back. Visit our 1:1 Training page for more info on "The Walk Fix" or click below to schedule now.